Apol was born in the Hague September 6th 1850. He was a student of J.F. Hoppenbrouwer and P. Stortenbeker. 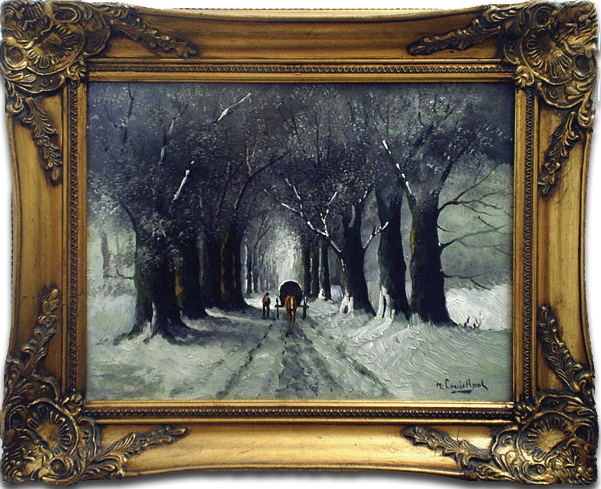 He became famous for painting beautiful winter landscapes as depicted in the masterpeice. Since 1866 his work has been exhibited at the Hague. In 1874 he won the Silver medal in Amsterdam and in 1898 the Gold medal in Barcelona. This exquisit masterpiece comes from the Netherlands and is from the turn of the century, most likely produced by a student of Apol during the artists lifetime.